As dining facilities grow into social hubs, institutions are revamping these spaces to increase on-campus interactions, attract new students, and provide access to more food options. As most traditional colleges and universities face increased competition, changing student demographics, and flat or decreasing enrollment, every area of campus must be re-examined. The areas that were once considered simply necessities—such as dormitories and dining facilities—can now become tools for creating a vibrant campus culture that will attract new students and keep current students plugged in and engaged. Here’s how three universities overhauled their dining programs to meet current student needs and create a richer quality of life on their campuses. Over the years, Kutztown University, Kutztown, Pa., had made many tweaks to dining program offerings, but students continued to express below-average levels of satisfaction with the program, says Gerald L. Silberman, vice president of administration and finance at Kutztown. To pinpoint the issues, the university engaged an independent dining services consultant to assess the program and provide recommendations for a complete program overhaul. “We were able to secure a large amount of student input, which suggested to us that our students were very concerned with program accessibility and flexibility and did not feel that our current program met their needs,” Silberman says. The institution’s existing dining service provider was willing to help revamp the program, agreeing to significant contractual modifications to reflect the requirements of the new program. In the summer of 2015, Starbucks opened in the Student Union. “The venue was extremely successful and helped the students deal with the closing of the Cub Café during the fall semester,” Silberman says. Several academic departments, and student clubs and organizations were accustomed to using the Student Union’s multipurpose room for their events. In planning for the renovation, Silberman’s team reviewed its room scheduler software to see which groups had used the room in the past, and notified them more than a year in advance that the room would not be available that fall. The Student Union staff offered assistance to the groups in finding alternative spaces across campus, and in some cases, reconfigured the room after the lunch period to serve evening programs for those who had no other alternatives that could work for their events. During the summer 2016 semester, Kutztown renovated the front end of its south campus dining facility, which seats about 240 people. The facility was upgraded to include four dining options: Sunnysides is a self-serve pantry, featuring a breakfast nook with cereal, waffle, and yogurt bar, as well as salads and sandwiches; Avalanche’s is Kutztown’s go-to grill for breakfast all day, and specialty sandwiches and sides; Kafe offers drip coffee with specialty espresso beverages, desserts, and pastries; and Hearth serves toasted subs, personal pizzas, and more. In addition, the facility, which opened in fall 2016, added televisions, games, and comfortable seating to serve as the university’s 24-hour dining venue. In addition to facility changes, Kutztown revamped its dining program choices—and these changes had the greatest impact on student satisfaction, Silberman says. For instance, the university began offering “MyTime Dining,” a program that allows any student with a meal plan to gain unlimited access to meal plan facilities during operating hours. With the rollout of this plan, leaders also increased operating hours for all dining venues, including offering the new 24-hour venue. While staffing costs increased for the food service vendor, food costs actually decreased after implementing the new program, Silberman says. Student satisfaction increased largely because the design of the renovated space is much more welcoming and conducive to students who want to socialize and visit. The philosophy on the previous space was to get students in and out quickly, and while many students are still in and out quickly because of their class schedules, the renovated space is an ideal place to hang out and stay awhile, mimicking the environment of Starbucks or other familiar upscale retail locations. “When we introduced the new meal plan program, a semester after the new space was opened, it was icing on the cake for students, and just added so much to their meal plan value,” Silberman says. Although student satisfaction with the dining program has increased, Kutztown leaders continue to talk with students to refine and improve the program. For instance, the program didn’t initially include takeout options, but after implementation, a group of student leaders met with administrators and mentioned that many students had difficulty accessing the dining facilities during lunch because of their class schedules. As a result, leaders implemented a takeout program and now provide a large number of takeout lunches to students who have challenging schedules. To help meet the needs of commuter students, Holden and his team turned to retail dining. “Retail had not been a focus [in the campus dining program]; it was there only because of an obligation, not an opportunity,” he says. “Our retail facilities were very dated and were not meeting the needs of our students. By listening to the students, we were able to identify important issues and to adapt both our retail and residential programs to better fit the growing demand.” For instance, before changes were made, many students left campus to frequent popular retail dining locations. Campus dining options were simply places to grab a quick bite rather than hang out and socialize or hold a study group. Bringing new retail platforms proved to be transformational for the campus. For instance, in the past year, Starbucks, Einstein Bros. Bagels, Caribou Coffee, Panda Express, a university-branded pizza concept, and a food truck have opened on campus. In addition to new options, the branded concepts are open longer hours, offering more opportunities for students to eat around their class schedules and to gather together. Overhauling retail spaces has helped boost dining plan revenue, but it has also contributed to a more vibrant campus life, leading to richer opportunities for student interactions, group gatherings, and enabling students to stay on campus to eat, rather than leaving campus for popular retail dining spots. This year, retail program revenue has doubled from last year, and meal plan sales, which are all voluntary, have gone from 8,600 to 11,000 in two years. “Our results have been amazing,” Holden says. “The areas reflect our focus on students. The locations are vibrant and welcoming, and traffic in the Student Union has increased. It has enhanced student life and recruitment and retention.” At orientations, students and their families talk about the food, its quality, and the offerings, Silberman says. Students have more opportunities to hang out together, which is important for building a community. And while the changes are fairly recent, the university’s data show significant increases in the number of returning student purchasing meal plans, including both residential and commuter students: At UGA, campus meal plans are completely voluntary and the growth after implementing change has netted nearly a 30 percent increase in students on meal plans. With expanding student enrollment, the University of Kentucky in Lexington had been building new residence halls to support that growth. Between 2013 and 2015, the university spent or committed more than $2.3 billion in construction of new campus living, learning, research, and quality-of-life spaces. Cutting-edge dining facilities were the missing link to the ideal campus life. The University of Kentucky issued a request for information to several vendors, and when vendors showed interest, followed with a request for proposals. Leaders met with the district managers with whom they’d be working on a regular basis and visited other institutions that use the vendors they were considering. Eventually, they selected Aramark as the university’s new dining partner, signing a 15-year agreement that includes a $200-million Aramark investment and covers student dining as well as athletic concessions and catering. That capital infusion has refreshed the university’s existing dining facilities and supported construction of a new, 85,000-square-foot dining hall with all-display cooking that seats 1,000 people. Brands that are new to campus such as Steak ’n Shake; Brioche Dorée; and Freshii, a health-minded brand, were added in existing facilities. K-Lair, a campus eatery with a long tradition at the university, had closed in 2013, and was rebuilt, enlarged, and reopened. And the price of an all-you-can-eat meal plan decreased 26 percent in the first year. Although student satisfaction with the dining program has increased, Kutztown leaders continue to talk with students to refine and improve the program. Students at the University of Georgia have more opportunities to hang out together, which is important for building a community. 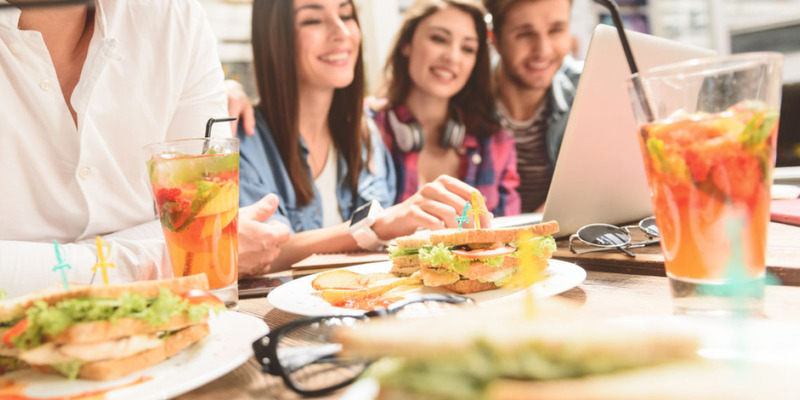 Students’ expectations of campus dining have evolved significantly in recent years, and dining services can be opportunities to woo new students, retain current students, and increase student satisfaction and alumni support. Is your dining program doing all that for your campus? Consider these seven questions to determine the answer. 1. Do dining facilities offer flexible hours to meet the needs of students with early or late classes? 2. Do they include familiar retail names as well as unique campus favorites or traditional eateries? 3. Are the dining plans affordable and flexible? 4. Do the facilities offer open, inviting spaces for long, leisurely lunches or dinners with friends, similar to a comfortable, upscale restaurant? 5. Is the food worth coming back for? Do alumni hope to eat at a favorite campus eatery when they return to visit? 6. What do your students and faculty members want from your dining services that they aren’t currently getting? 7. Do the dining facilities increase the quality of life on campus? Are they one of the things that admissions officers proudly show off to potential students?